This handbook is informational only. 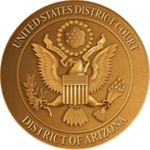 The United States District Court for the District of Arizona cannot provide legal advice to the public. Clerk’s Office staff are prohibited from giving legal advice pursuant to 28 USC § 955. This handbook, including all files and hyperlinks therein contained, is a guide for self-represented litigants. It is not legal advice and should not be considered as legal advice. The Court will not answer questions about the handbook’s content or how it may pertain to an individual case, except as required by law. Those seeking guidance concerning a federal action should consult with an attorney. The handbook does not, is not intended to, shall not be construed to, and may not be relied upon to create or to limit any rights, substantive or procedural, enforceable at law by any party in any matter, civil or criminal. Do not cite this handbook in filings with the Court; cite the applicable rules and law. Warning to Incarcerated or Detained Persons: Please note that some parts of this handbook will not apply to actions filed by incarcerated or detained persons. Detained litigants are often required to comply with different statutes and Court rules. These rules may include—but are not limited to—the use of Court-approved forms where applicable and the exhaustion of administrative remedies prior to filing suit. NOTE: Please be patient after clicking the button below. The Handbook is a large document, so depending on your computer, it may take a few minutes to load.